GLAZE is Petri Quinn’s story: she’s 15 years old when we first meet her, which means that she’s counting down the days, hours and seconds until she can get hooked up to GLAZE, the social network of the moment. Petri’s desperation to get connected is compounded by the fact that she’s a bright girl who’s been put up a year at school. Which means, everyone she’s in class with is already 16 and already ‘hooked up’. Petri’s a terrific character: her voice is strong and I took to her from the very first page. She’s the only child of a single parent and has had to be relatively self-sufficient because of her mother’s work demands. They have a slightly distant relationship with each other, as a result. Petri’s a bright girl, but not one who shouts about it. All she wants is what a lot of people want: to fit in, to be a part of things, if not the centre of them, and for the dreamy, cool kid in her year to notice her. And she’d really like to be ‘hooked up’ to GLAZE. And all credit to the girl, despite her mother working as a high-level Executive for the company behind GLAZE, Petri hasn’t tried to use that to get connected early. 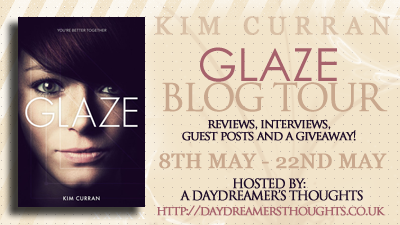 Kim Curran cleverly shows both the good and bad in being on a social network in GLAZE, especially one as pervasive as this one is. She shows the uses and benefits of having so much information and so many resources readily available and easily accessible before showing how it all could be open to misuse and abuse by the authorities, by the company responsible for designing and running it, by other interest groups and by its users. If you’re concerned about the way the current media presents (or, depending on your view, moulds and makes) the news before feeding it to us, and how statistics and information are manipulated to suit what ‘they’ want to tell us, then GLAZE feeds right into those concerns. It might also make you reconsider just what you share and who you connect with when you next use any of our existing social networks. As well as being a timely look at how connected we all are, GLAZE is also a thrilling and unnerving look at how much of our lives are lived and shared online; how much information we give out about ourselves, our family and our friends, complete with locations and photos, and for some people, even with a running commentary of their day-to-day experiences and routine. It’s also an important reminder of what is important: giving your time over to family and real friends and spending quality time with them; making genuine connections with people; looking up and noticing what’s going on in your immediate environment and the wider world; questioning what you consume, especially when it comes to information; and, ultimately, being unafraid to forge your own way sometimes, even if that goes against what the majority are doing, because it might just be the better path. If that all sounds deep, then that’s because GLAZE gave me a lot to think about, both while I was reading it and for these past few days since having finished it. But that didn’t stop GLAZE from being an exciting, fast-paced read; a technological thriller that I’d recommend anyone, who lives even a little bit online, to read. GLAZE will be published as an ebook on 15th May 2014 but 75 limited edition hardbacks will also be available from Jurassic Publishing. 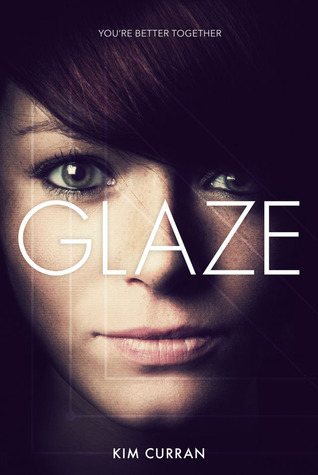 Add GLAZE to your Goodreads bookshelf. Dublin-born Kim Curran is the award-nominated author of books for young adults, including Shift, Control and Delete. She studied Philosophy & Literature at university with the plan of being paid big bucks to think deep thoughts. While that never quite worked out, she did land a job as a junior copywriter with an ad agency a week after graduating. She’s worked in advertising ever since and is obsessed with the power of the media on young minds. To find out more, you can visit her Author Website, Follow Kim on Twitter, Like her Facebook Page, Find her Books on Goodreads or Find Kim on Youtube.